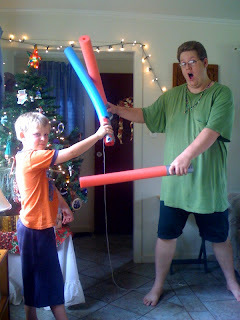 A friend of ours came up with this idea to make light sabres out of pool noodles and duct tape. After reading his blog about it, I went to our local store. They NEVER have pool noodles but for some strange reason they did, first time ever. 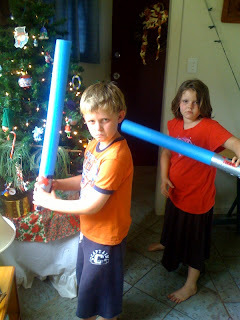 And so I picked up 2 and made LIGHT and DARK force sabres with duct tape and electrician's tape. 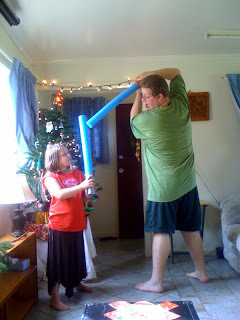 Then we turned up the Star Wars music and had daddy time, and a big pillow-fight like war. It's been over a week now and the kids haven't put the noodles down, and are always challenging me to a fight. These toys cost pennies to make, and are really very popular. I'm still amazed our store had fun noodles. christmas pose. The string is because I tried to make a 'force grab' of my own sabre when it dropped. It turned out to be silly. 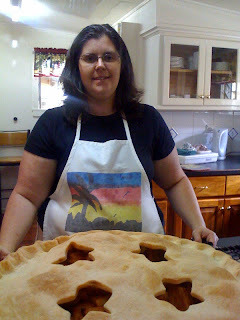 for my birthday in November, my wife made a normal sized apple pie, but when I took a picture of it, the pie looked HUGE because of the angle I used. So we're telling people this is the world's largest apple pie. Most folks enjoy seeing our kitchen, which was newly remodeled by the previous owners right before we bought the house. Kendal spends a LOT of time in this kitchen so I'm glad it's a nice place to be. The ceiling comes to about 6'6" so I can actually hit my head on it in parts. It's a low ceiling (-;. Quite the pose. I dunno Christmas and Star Wars... do they go together? I used to make a lot of sound effects during our sabre fights, but we found that if the foam rubs against other foam, it sort of already makes the sabre clashing sound. Today the family took a trip into town to see if we couldn't find a special item to bless our haus meri with. We're the only remaining family that employs this wonderful woman. She helps keep our house orderly so we can do the jobs we came to do. Since it takes all day in the sun to dry clothes, it's nice to have someone devoted to doing your laundry, and mopping the floors. Over the years we've developed a great relationship with this woman, and so for Christmas, the only time of the year we can 'amamas' (bless, give a gift to) someone without them incurring 'dinau' (debt) to us, we decided to find something her whole family could use. We settled on blankets and towels, and school bags for her children. 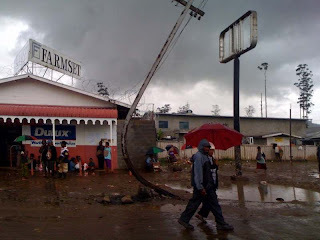 In the process we saw this electrical pole. I only have a few ideas how it got to be that shape. "I have this bible dedication video and I can't seem to show it on my toshiba laptop." I was surprised that the pacific area director had a copy of the video. I had originally burned the dvd so it would play NTSC, PAL, on any dvd player or provide data files for MAC or PC... so this was my first complaint about inability to show. I compressed the data file with MPEG4 (h.264) and it dawned on me, she either needed ffdshow codecs or vlc player installed. She asked "am I truly the first complaint about this?" I replied "well I didn't know the video had made it outside our country, and most folks here are adept at using VLC and multiple format dvd players, so ... yes... you actually are." "well look at that, Ukarumpa ahead of the rest of the world." she replied jokingly. I chuckled. Of course we're not ahead of the world, it's a common format... but it did feel good for a moment to think that at least were weren't BEHIND the rest of the world. She then explained to me her intentions to copy the video and disperse it, which I'm fully in favor of. Still I don't think she knew I was the creator of the video. It's odd to me, that this little video I did for fun and for ministering to people HERE, to remind them why we do what we do.... has reached so far already. the compression formats that work best for me (smaller so I pay less to transfer) (divx, h.264) simply don't work on windows machines with XP by default... so when I send videos home folks can't play. INSTALL VLC (videolan) player, or install DIVX and ffdshow codecs... and this problem goes away. how do we get our hair cut in a land of no barbers or hairstylists? how do we handle the 'christmas tree' in a land with no tree lots? Hair - different people who have some modicum of hair styling skills will make themselves available at certain times to cut hair. Some for free some for a small fee. 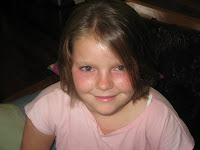 Our daughter decided she wanted short hair and so we found a friend who would cut it. 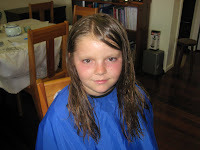 I personally get my hair cut from a friend who does it for free. Others simply shave their heads with their own clippers. You get used to not seeing very fancy hair styles, which is usually rather okay with the guys but the women do seem to look forward to a nice haircut when they go on furlough. It is our yearly tradition (our third now)to go tree hunting. 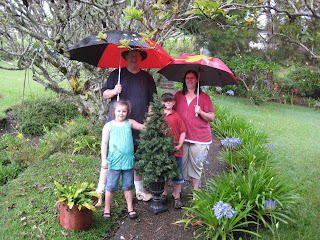 We brought with us a $15.00 artificial tree (tiny) from Costco. Each year I paint a "TREES" sign, plant the sign somewhere on our centre, and hide the tree. Then we pile in a vehicle, listen to christmas music, sip cocoa, and the kids direct my driving "turn left dad.. no turn right" until they find the elusive "trees" sign. Then we stop, get out and go searching for OUR tree. This year I hid it harder than ever, but from the time I hid to the time we found it, a torrential downpour soaked the tree (complete with lights already on it) So we all got wet finding it this year. It was a LOT of fun. My original idea was to get everyone who had fake trees together, and put them in a field and make a huge fake tree lot. And everyone comes and 'cuts down' their own tree. Complete with free firewood, mistletoe, families arguing over which tree to find, and all these services. When we first got here, everyone ignored my idea. Now that we've been here 3 years people know us more and my sense of humor and have decided they really like our tradition and want to be a part of it. NEXT year we'll be in the States for Christmas, so we'll have to do it 2 Christmasses from now. We make our own fun here.